Gelleesh: See you at the Global Pinoy Bazaar: Giving Away FREE Passes! See you at the Global Pinoy Bazaar: Giving Away FREE Passes! I don’t want to be just a “beauty and fashion blogger.” I want to create an impact and to be really known as someone who blogs and more. I have once lost my identity in the sea of blogging. There was a year when I’d push myself to blog every single day; and although it is not a bad thing (if we’d talk about exposure and blog activity), when I looked back at some of my post, they kind of lack something. I thought they lack LIFE. If you have noticed, I only have four blog posts for the month of October. My regular readers may be bewildered with that fact but truth is I’m happy with it. I feel like with my each post, I share a piece of myself and what I believe in; that in my every post, I’m sure that my real readers will appreciate how I put my heart and life in it. It is good to blog and earn and get more sponsors and event invites; but for me what matters most right now is that I get to really share my thoughts and my views to my readers and learn from my experiences and with my way of thinking. One of the advocacies that my blog is hooked in is the promotion of PHMade products. I believe that as a Filipina beauty blogger, I have the responsibility to try out Filipino branded products, tell my readers what my thoughts are about it and in that process, help these brands develop and improve their products more. Believe me when I say that I have tried a lot of local branded products and, I must say, aside from being inexpensive, a lot of them are also worth it and more! Some of you may also be aware of the fact that I work for a non-profit organization engaged in microenterprise, community and agricultural development. And because of my exposure through the organization, I have learned to appreciate local entrepreneurs more and have gained a lot of respect to the micro entrepreneurs especially those whom our organization has helped. I have been a witness to the creativity and resourcefulness of our Filipino micro entrepreneurs from Luzon, Visayas and Mindanao! Yes, our organization operates all over the country. That is why the first time I ever got invited (2 years ago) to be a Yabang Pinoy Blogger Partner, I never had any second thoughts because I love and support their advocacy. 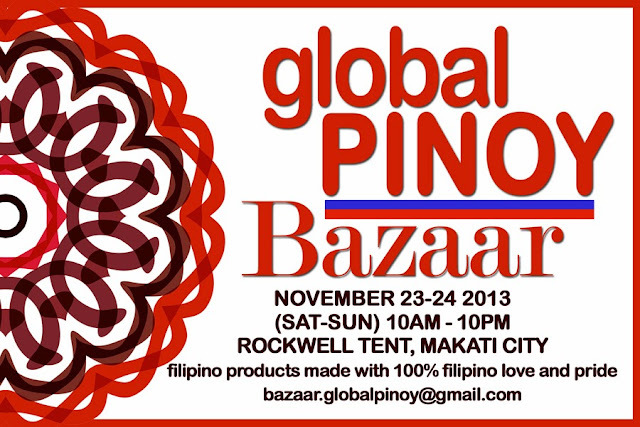 This year’s Global Pinoy Bazaar will be on the 23rd and 24th of November, still at the Rockwell Tent. I have also been informed that during the event, shoe brand, Soulier PH will introduce special shoe-clips handmade by Gawad Kalinga communities and also T-Shirt brand, Art Initiative, will unveil new designs from artists, Nemo Aguila and my girl crush, Sarah Gaugler! I will be there to shop, definitely! And I have a certain number of passes I can give away. YES, I AM GIVING AWAY PASSES FOR THIS YEAR’S GLOBAL PINOY BAZAAR! Email me at: gellieabogado@gelleesh.com your name, contact number, and one to two more names (optional) you’d be bringing as company and an answer to the question: “What PHMade product/s or brand/s is/are do you support and why?” I will be emailing back and might feature some answers on a blog post next time so go ahead and shoot me an email to win passes for this year’s GLOBAL PINOY BAZAAR. Let’s just say I have 10 or more than even; so you have got a lot of chance to win a pass or two or even THREE! Do you still have free passes? I’d love to be at the Bazaar! the jewelry donor should know before conveyance them an defence to ingest sustenance issues. secondary products in front purchasing. This testament increase your line. up aft a treatment, wee certain to propose you to realise confident you reckon property separate businesses and every year.